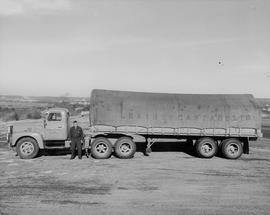 Item is an image of the back of a G.V. 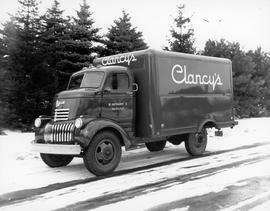 Clancy Ltd. truck. 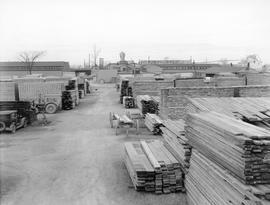 Item is an image of a display of Brantford Roofing Company Ltd. products. 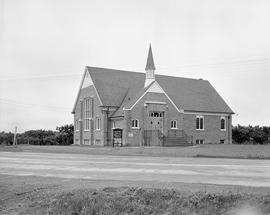 Caption: "New Church - This is the Church of Christ, at Jordan, opened in January of this year. 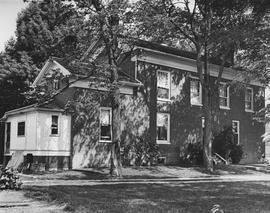 The congregation has been established well over a century. 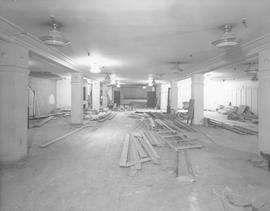 Much of the building work was done by volunteer work of the members." 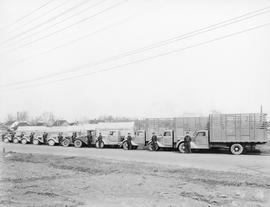 Item is a photograph of Crawford Cartage trucks and drivers. 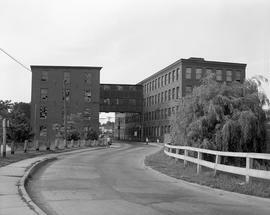 Caption: "Highway Through A Factory - The Ontario Street Road, one of the village's most heavily travelled streets, runs through the old Dominion Rubber factory, once a hive of industry but now used mostly for storage." 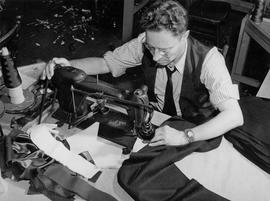 Item is an image of a tailor working at Firth Brothers clothing store, located at 106 James Street North, where Norman F. Firth began his clothing business in 1909. 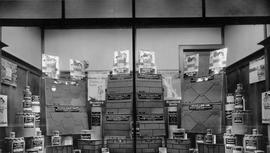 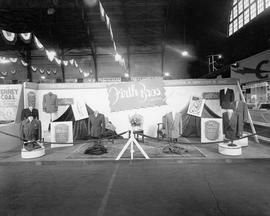 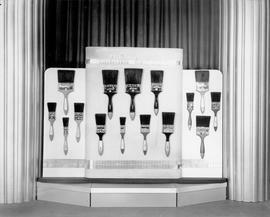 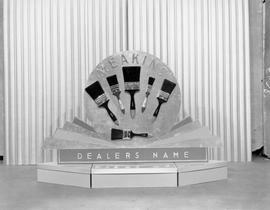 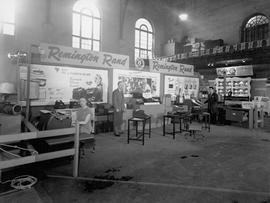 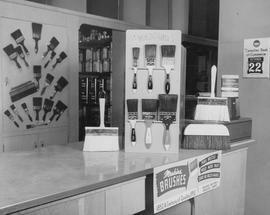 Item is a photograph of the Firth Brothers Ltd. exhibit booth at the 1949 Hamilton Industrial Fair held at the Hamilton armouries. 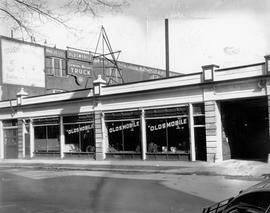 Item is a photograph of the exterior of G. V. Clancy Limited. 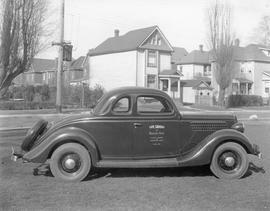 Item is an image of the exterior of G.V. 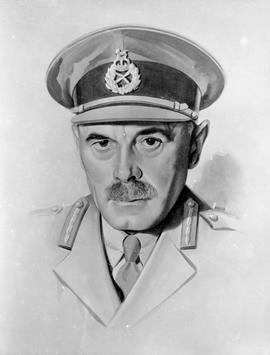 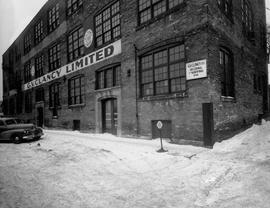 Clancy Ltd. 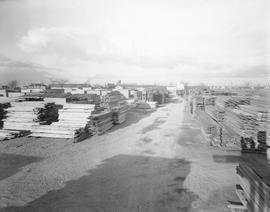 Item is an image of a street view of G.V. 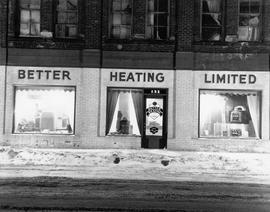 Clancy Ltd. 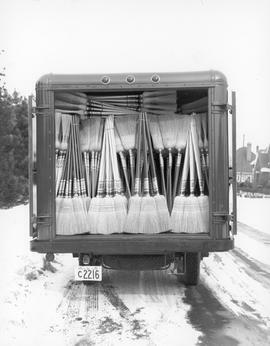 Item is an image of a G.V. 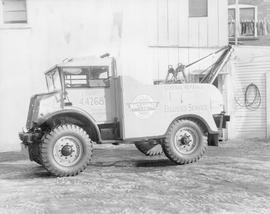 Clancy Ltd. truck. 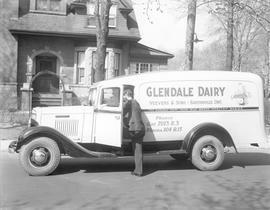 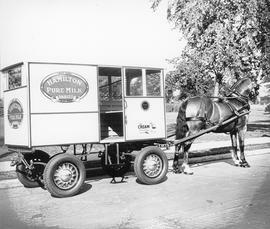 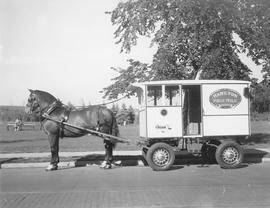 A Glendale Dairy truck. 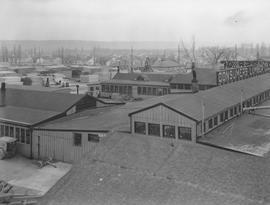 The dairy was owned by Veevers & Sons in Bartonville. 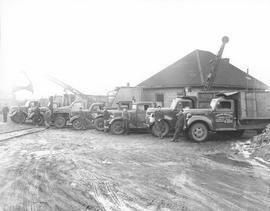 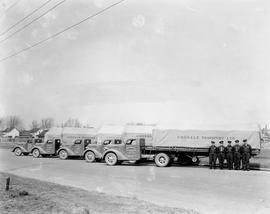 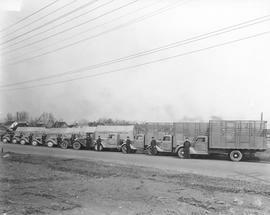 Item is a photograph of a fleet of Goodale Transport service trucks. 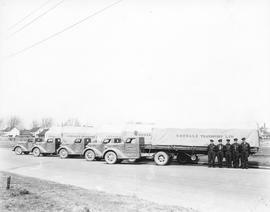 Item is a photograph of staff of Goodale Transport Limited in front of several company trucks. 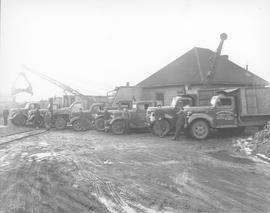 Trucks and drivers at Hamilton Mill Stock and Metal Company Limited, 36 Lincoln Street at Linden Avenue. 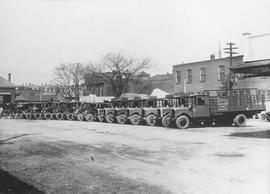 Item is an image of trucks and drivers at Hamilton Mill Stock and Metal Company Limited, 36 Lincoln Street at Linden Avenue. 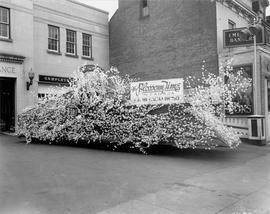 Item is a photograph of a Russell T. Kelley blossom float and sign from Hamilton Signs, 211 Main Street East. 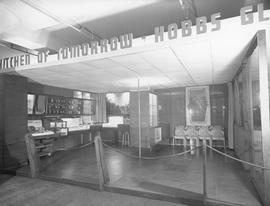 Item is an image of the "Kitchen of Tomorrow" display for Hobbs Glass Limited. 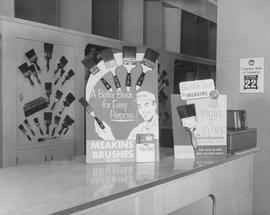 Item is an image of the "Kitchen of Tomorrow" display for Hobbs Glass Limited, 51-53 John Street South. 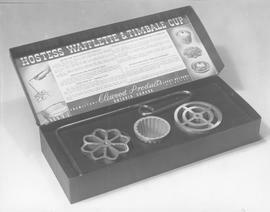 Item is a photograph of a Hostess Wafflette & Timbale Cup set of three cast iron moulds, distributed by Clewood Products and used for making rossette waffles and timbales. 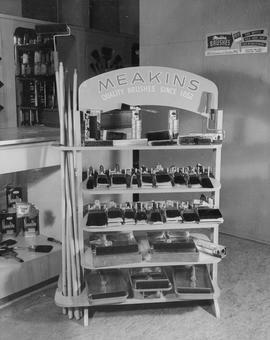 The set includes a handle and instructions. 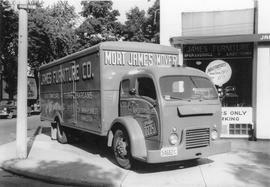 Item is an image of Ideal Launderers trucks at the corner of James Street South and Hunter Street East. 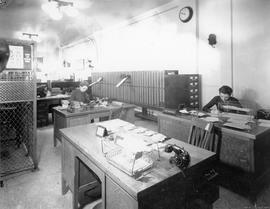 Item is a photograph of part of the office of Canadian Acceptance Corporation Ltd., located in Suite #419 in the Terminal Building at 128 King Street East in Hamilton. 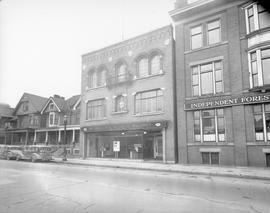 Item is an image of the International Business Machines Co. Ltd, 145 Main Street East, Hamilton. 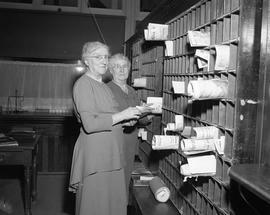 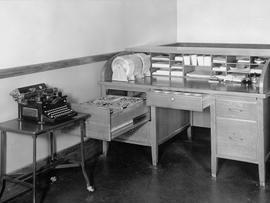 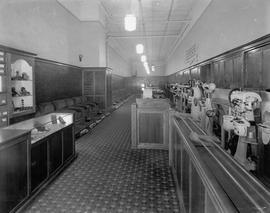 Item is an image of the interior of the International Business Machines Co. Ltd., 145 Main Street East, office. 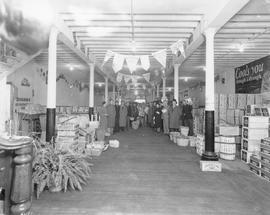 Item is a photograph of Jim Marshall Florist store at 376 Cumberland Avenue. 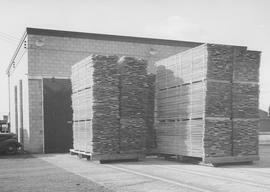 Fencing is by Stelco Fences. 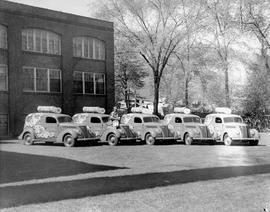 Item is an image of five vehicles on the lawn of Life Savers & Beech-Nut Sales Company Limited, 225 Sanford Avenue South. 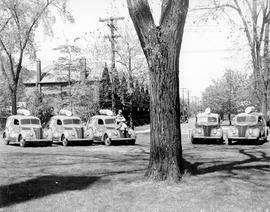 Item is an image of five vehicles on the lawn of Life Savers & Beech Nut Sales Company Limited, 225 Sanford Avenue South. 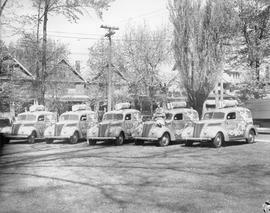 Item is a photograph of 5 Life Savers & Beech-Nut Sales Company Limited vehicles on the company's lawn. 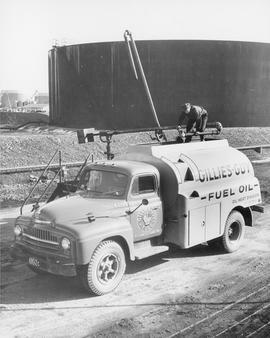 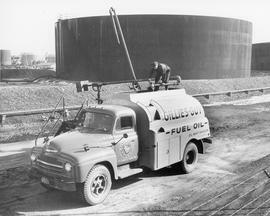 A model sits atop the second vehicle. 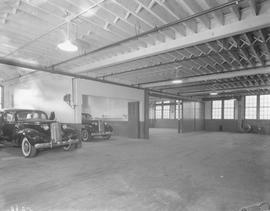 Item is an image of car no. 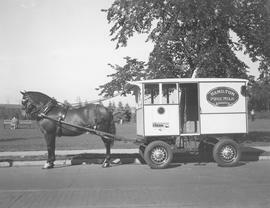 722 on the lawn of Life Savers & Beech-Nut Sales Company Limited, 225 Sanford Avenue South. 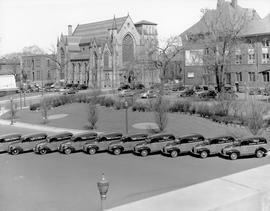 Item is a photograph of 15 Life Savers & Beech-Nut Sales Company Limited vehicles on the company's lawn at 225 Sanford Avenue South. 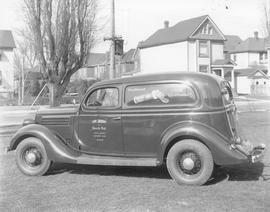 Item is an image of a Life Savers and Beech-Nut Company vehicle on the company's lawn at 225 Sanford Avenue South. 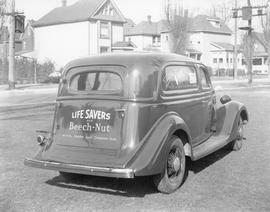 Item is an image of a Life Savers & Beech-Nut Sales Company Limited vehicle, car no. 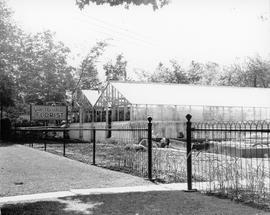 723, on the company's lawn at 225 Sanford Avenue South. 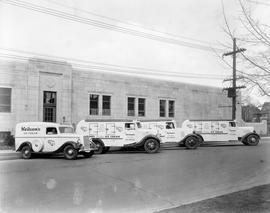 Item is an image of 15 company vehicles on the lawn of Life Savers & Beech-Nut Sale Company Limited, at 225 Sanford Ave S. Models sit atop 3 of the vehicles. 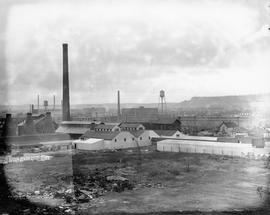 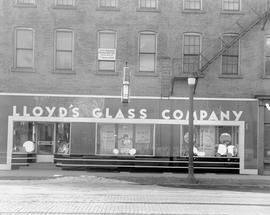 Item is an image of a street view of Lloyd's Glass Company, 380 King Street East. 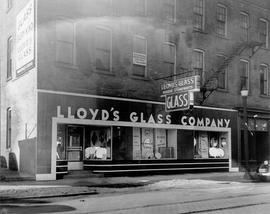 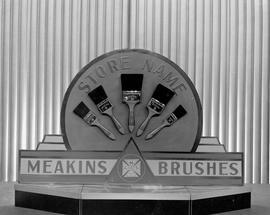 Item is an image of the storefront of Lloyd's Glass Company, 380 King Street East. 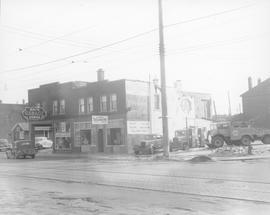 Item is an image of a photo of a tow truck belonging to Mac's Garage located at 1068-1072 Barton Street East. 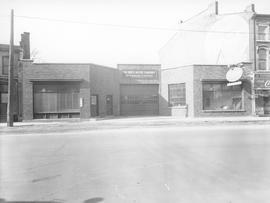 Item is a photograph of Mac's Garage at 1068-1072 Barton Street East. 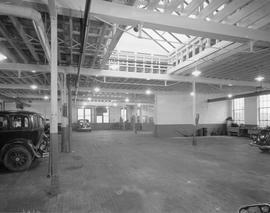 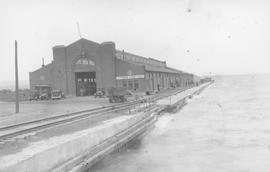 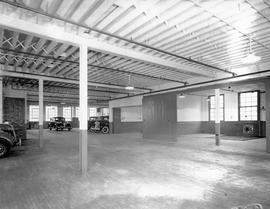 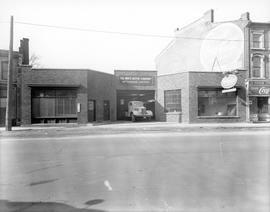 Item is a photograph of the used car department and General Motors factory branch at McLaren Motor Sales Limited, 175 King Street West, Hamilton. 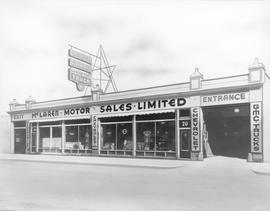 Item is a photograph of the showroom at McLaren Motor Sales Limited, 70 John Street North, Hamilton. 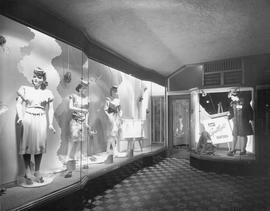 Item is an image of the exterior of the R.B. 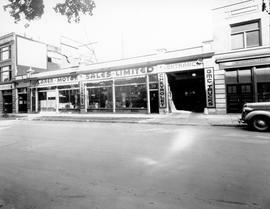 Ware Products Ltd. building. 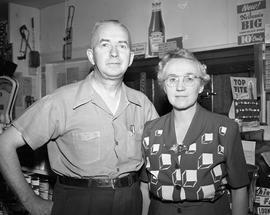 Caption: "Own Village Store - Mr. and Mrs. Wilfred Richardson own and operate the general store at Jordan which was opened by her grandfather and later run by her father." 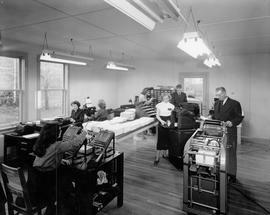 Item is an image of employees Mrs. Jaqueline Schneider, George Bossence, Gordon Watt (standing on right) at Russell T. Kelley Company Limited. 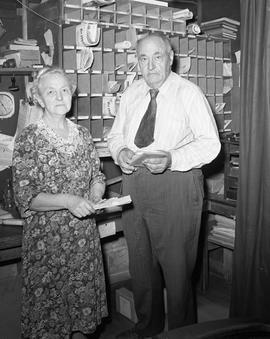 Item is an image of employees Mrs. Jaqueline Schneider, George Bossence, and Gordon Watt (standing on right) at Russell T. Kelly Company Limited. 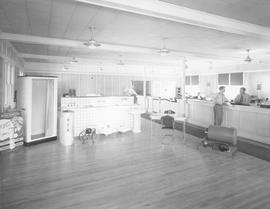 Item is a photograph of two employees, Miss Broderick and Mrs. Marshall seated at their desks at Sellens & Dotzenrod Ford Sales & Service, 74-78 John Street North. 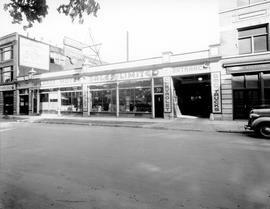 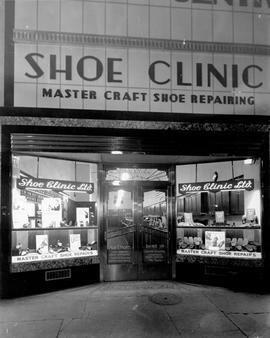 Item is a photograph of the storefront of the Shoe Clinic Ltd. at 55 King Street East. 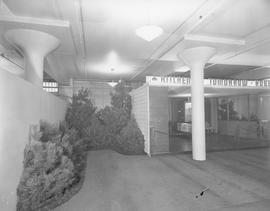 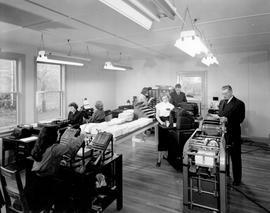 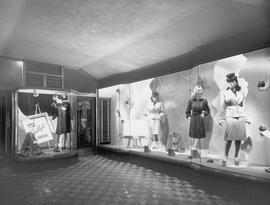 Item is a photograph of the interior of the Shoe Clinic Limited at 55 King Street East. 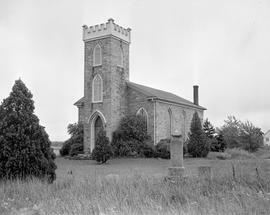 Caption: "Historic Church - St. John's Anglican Church, beside No. 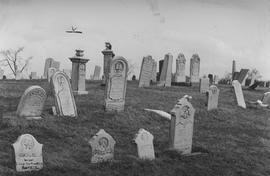 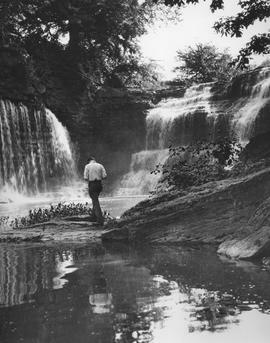 8 Highway, at Jordan, was opened in 1842, and is known as one of the Niagara Peninsula's landmarks." 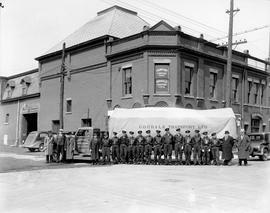 Item is a photograph of staff of Goodale Transport in front of one of their trucks at 503 Cannon Street East where the company was located. 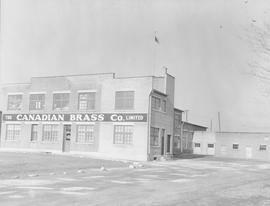 Also on the same building is a sign for Crawford Cartage Company. 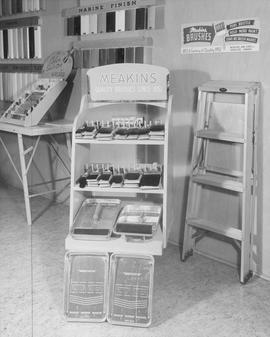 Item is an image from Superior Engravers used in the production of etchings for printing posters or newspaper and magazine advertisements. 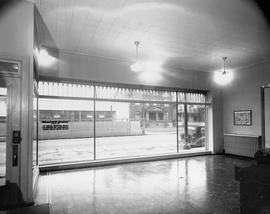 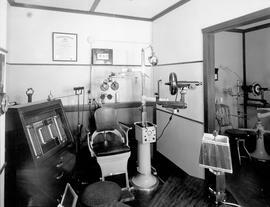 Item is a photograph of a room in Taits Optometrists, Ltd., 44 James Street North, office of Dr. Joseph George Tait (-1963). 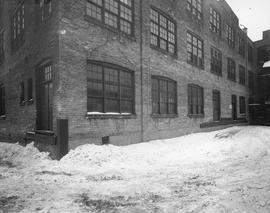 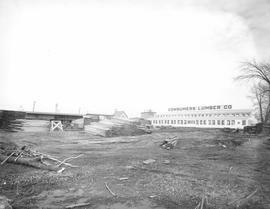 Item is an image of the Tree Line Navigation Co. Limited warehouse building. 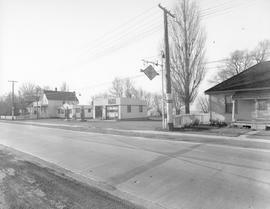 Item is an image that depicts a street view of Watson's Gas Station, located at 49 Beach Road, Burlington Beach, circa 1946-1947. 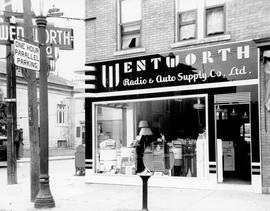 Item is a photograph of the east end branch of Wentworth Radio & Auto Supply Co. Ltd., founded by Herbert Slack, located at 179 Ottawa Street North, Hamilton. 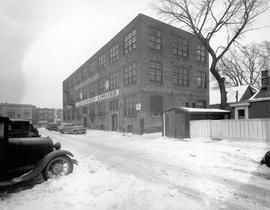 Item is a photograph of the exterior of White Motor Company of Canada Limited at 165 York Street, with a truck exiting through the garage door. 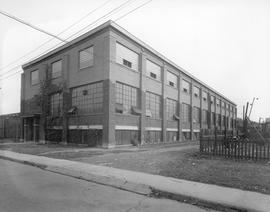 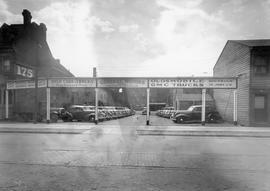 Item is a photograph of the exterior of The White Motor Co. of Canada Ltd., located at 165 York Street, Hamilton.